The group was organized by the ‘Unist’ot’en leadership of the Wet’suwet’en Nation alongside their grassroots allies and supporters. 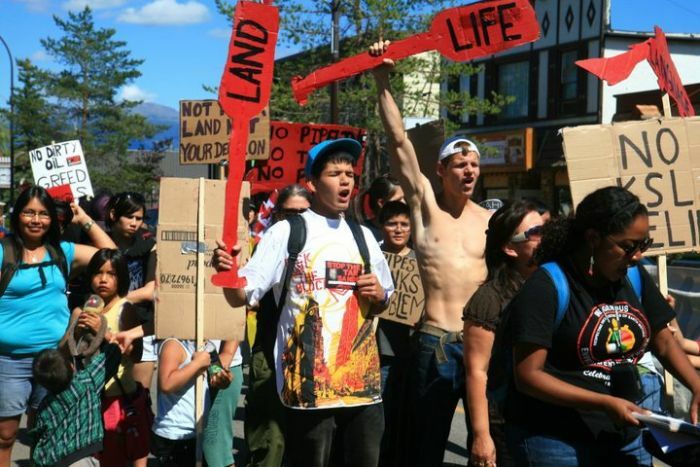 They assembled in Smithers to organize a demonstration designed to assert their title and rights on their ancient lands. The action was a well-planned march with strategic stops at the Ministry of Forests office and the Ministry of Environment office where the Unist’ot’en asserted their legitimacy as a governing body and their right to free, prior and informed consent before any decisions about development on their land. The march also provided the ‘Unist’ot’en with an opportunity to offer support to the allies who had come in to support the action. 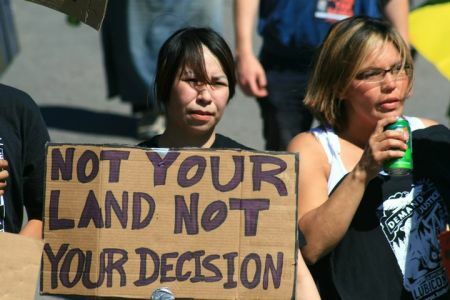 The Tsilhqot’in Nation members from Tl’etinqox (Anaham) and Tl’esqox asserted their rights to stop proposed plans for Prosperity Mine to develop a copper and gold body that will destroy and drain a sacred lake called Teztan Biny (Fish Lake) in their traditional territories. The Lubicon Cree of central Alberta spoke of their work to have their rights and title asserted on unceded lands. The Athabasca Dene and Mikisew Cree of Northeastern Alberta are fighting for their very lives with the ongoing Tar Sands contamination of their aquifers and ecosystems which are creating a deadly epidemic of rare cancers among their population. The struggles of the Wet’suwet’en and their allies are linked. The Tsilhqot’in are a neighboring nation fighting mining development not only on Fish Lake, but also on the historic site of Hungry Hill, a burial ground shared by both the Wet’suwet’en and the Tsilhqot’in peoples. Meanwhile, communities were represented from Tar Sands-impacted communities, from those resisting their devastating impacts at ground zero, to those resisting the construction of tar sands pipelines and refineries. At present there are 7 pipelines planned to cross through the territory of the Wet’suwet’en First Nations, the least of which is the Gateway Pipeline proposed by Enbridge to bring tar sands oil to the coast of BC. In response, the Unist'ot'en have set up a permanent camp on their territory where the proposed pipeline is set to be laid. Unfortunately as Carla Lewis, from the Gitdumden clan and band council member with the Wet’suwet’en First Nation pointed out, unwelcomed development is not something new on Wet’suwet’en territory. The group marched confidently down the road parrallel to Highway 16 receiving honks of support from passing vehicles. One group called the Youth On Water Program with the Skeena Headwaters Conservation Coalition even stopped their van and joined in with the march. Following the joyous chants of “Protect our Rights! No Enbridge Pipes!” the group made its way to the main street of Smithers. With quick professionalism, 5 members of the group hung a banner over the main street reading ‘No Pipelines’. Cars streamed underneath continuing their supportive waves and honks, while more bystanders joined in and gave comments of support. As the group rounded Main street they stopped at the local branch of RBC. The Royal Bank of Canada has been criticized for being the largest financier of the Tar Sands which undermine the Aboriginal rights of numerous Metis and First Nation communities including the Athabasca Chipewyan and Lubicon Cree. The Rainforest Action Network successfully campaigned Royal Bank to adopt the principle of Free, Prior and Informed Consent (FPIC) to guide their investment decisions, but the bank continues to fund tar sands projects. In front of the BC Ministy of Environment youth from the group impressed everyone as they held up a cardboard mimic of a pipeline with the words ‘Greed’ ‘Cultural Genocide’ and ‘Toxic Spills’ written on the side to convey what the pipeline threatens to bring to their future. In a powerful move, another group of youth ran at the cardboard pipeline with cut outs of salmon and paddles holding the words of ‘Love’ ‘Culture’ and ‘Language’ breaking apart the pipeline with a powerful metaphor that holds so much truth. Onlookers admitted this type of demonstration is not something common in their small Northern town with a population of just over 5,000. But, the encouragement from the community suggests it may be a turning point with the Unist’ot’en leadership as they takie back their traditional role as protectors to take care of the land and create a healthy, safe, clean future for local people in the region. Sheila Muxlow works with the Sierra Club's Prairie Chapter.